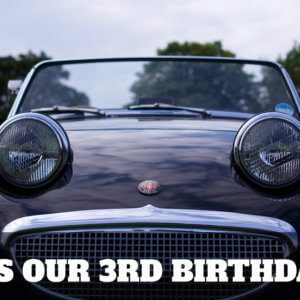 Take to the Road is celebrating 3 years since starting its classic car inspired journey. Which has got me in a celebratory mood. That usually leads to browsing the classifieds to see what classic cars might be available. And one that immediately caught the eye is this very cool looking 1971 Triumph Miglia Speedster, which is coming up for sale at Historics at Brooklands Auctions on 3rd March 2018. It is fairly obvious why I choose this as the first Market Pick of 2018. And that’s because it looks like an old Maserati A6GCS racer from the 1950s. This was the heyday of beautifully designed open seat race cars. They really are breathtaking cars with so much style and grace, all combined with a remarkable racing heritage. The A6GCS was developed by Maserati to compete in the World Sports Car Championship. It first appeared in 1947 with a 1500cc inline six cylinder engine designed by Alberto Massimino. It ran triple Weber carburettors, producing 90BHP. Gioacchino Colombo continued the engines development, taking the 2 litre to 170BHP. This made the single seat racer much more competitive and brought Maserati much success. An A6GCS finished 3rd overall and 1st and 2nd in class in the 1953 Mille Miglia, beating off competition from Ferrari and Mercedes teams. It’s success at the Mille Miglia cemented its reputation in racing history. Such racing pedigree brings with it a certain price tag and a real Maserati A6GCS will set you back well over £2.5m at auction. Which is what makes this Triumph Miglia Speedster. It might not have raced in period at the Mille Miglia. And it doesn’t even qualify to run in Italy’s most famous racing event. But what you do get is the looks of a stunning Pininfarina designed race car, at a fraction of the cost. The lines of the Maserati inspired racer are exquisite. The Triumph Miglia Speedster is essentially a custom built kit car, which can be bought disassembled or complete from the factory. It is based on Triumph Herald, Vitesse or Spitfire running gear, which makes parts inexpensive and easy to come by. The Maserati inspired fibreglass coachwork is fitted over a Triumph chassis, leaving the builder with a choice of engine and gearbox. This particular Speedster features a rebuilt 2500cc engine from a Triumph 2500 TC, which has been mated to a Triumph manual overdrive gearbox. Other touches include a Jigsaw Racing Services 3:89 Big Diff and the suspension is uprated with polyurethane bushes all around. Instead of a Maserati inline six it’s got a Triumph inline six. The triple Webers are a nice nod to the original racing setup. What I love the most about this Triumph Miglia Speedster is how amazing it looks. 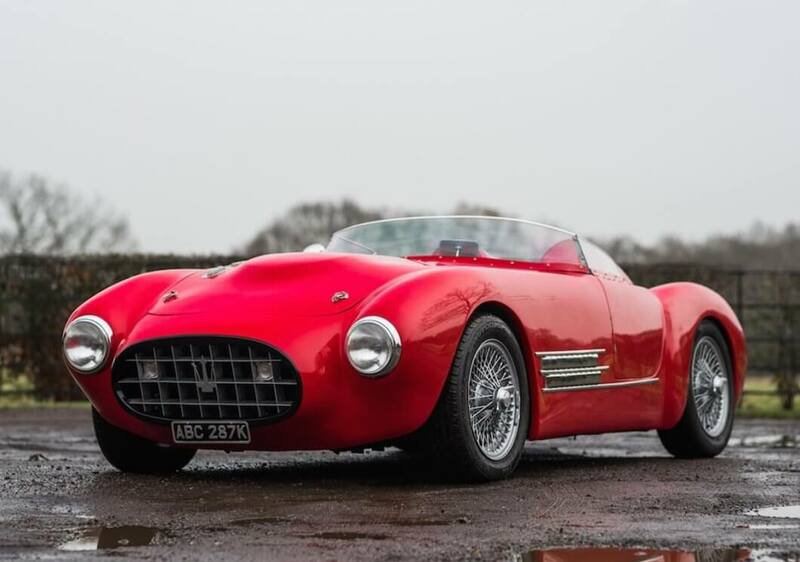 The Maserati A6GCS inspired body just looks the business in red and it sits superbly on it’s knockoff wire wheels. The low cut windshield, side vents and twin fins are all nice touches and fit the period racer style. And the interior looks a nice place to be. The dash is aluminium and the steering wheel is detachable for ease of access. With real Maserati A6GCS out of reach for pretty much everyone, the Triumph Miglia Speedster is the next best thing. 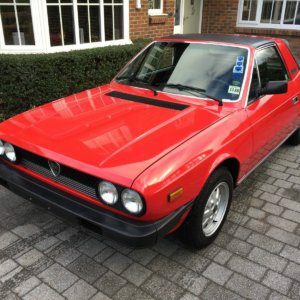 With an estimate of between £10,000 – £12,000, I can’t think of more fun way to get into the classic racer recreation scene. It might not have a legendary Maserati straight six under the bonnet, but I expect those triple Weber’s and all that fresh air will still put a massive smile on your face. As a birthday present I couldn’t think of one that looks better than this! Read about the 1948 Jaguar Mark IV sports saloon, first owned by the Deputy Chairman of Jaguar Cars, which was sold a Historics Auctions. ← It’s Take to the Road’s Birthday today!